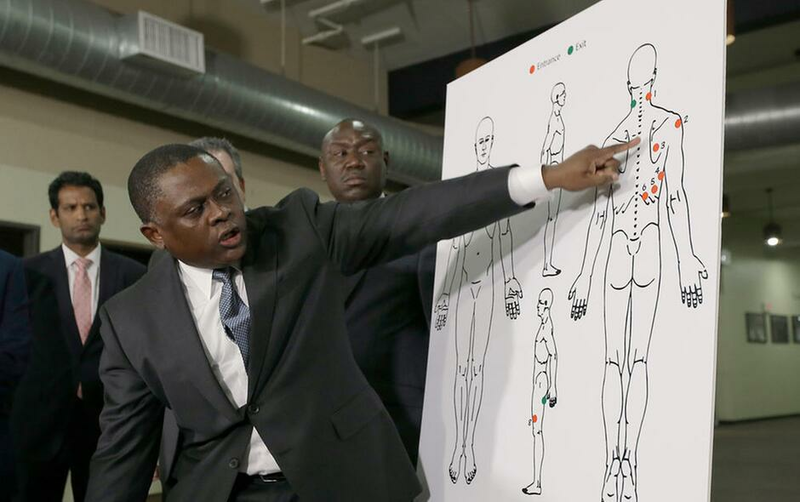 Pathologist, Dr. Bennet Omalu, gestures to a diagram showing where police shooting victim Stephon Clark was struck by bullets, during a news conference, Friday, March 30, 2018, in Sacramento, Calif. Omalu, who was hired by the family to conduct an independent autopsy, said Clark was shot seven times from behind and took up to 10 minutes to die. SACRAMENTO, CALIF. (AP) — Calls for justice and charges against two police officers who fatally shot an unarmed black man aren't abating in California's capital city after an autopsy showed Stephon Clark was shot in the back, a counter to the department's statement that he was approaching officers when he was killed. "His back was turned — he didn't get a chance," said Latarria McCain, who joined several hundred Friday in a downtown protest that lasted more than four hours, causing disruption and blocking traffic but largely remaining peaceful. Sacramento native and former NBA player Matt Barnes has organized another rally for Saturday afternoon, hours before a Sacramento Kings-Golden State Warriors game will bring thousands of fans to the downtown arena that protesters have twice blocked. Several Kings players joined black community activists' calls for racial justice at a Friday night community meeting, nearly two weeks after Clark's March 18 death. "I want to make sure that these mistakes that keep happening have consequences," player Garrett Temple said. He said it was not clear if Clark would have survived had he gotten immediate medical attention. Sacramento police responded with a brief statement that said the department had not yet received an official autopsy report from the Sacramento County coroner's office. It said the coroner's death investigation is independent from the investigation being conducted by police and the state Department of Justice. After 20 shots, officers call to him, apparently believing he might still be alive and armed. They eventually approach and find no gun, just a cellphone. "When a young man who is 22 is shot down in his grandma's backyard, which is supposed to be a safe place, I don't know. What's beyond a crisis?" said Nikki Whitfield, who works at a local adoption agency and attended the community forum. With a joyous but somber feel, the event marked a change in tone from the protests that have disrupted the capital city's downtown. But the message was similar, with several hundred members of the black community discussing police brutality and calling out of the names of black people who have been killed by law enforcement. Later, protesters chanted outside City Hall before marching through downtown for more than four hours. Black Lives Matter Sacramento leaders helped diffuse tension at several points, including when protesters had a brief standoff with police by an interstate ramp and later when the police handcuffed a hotel door shut as protesters tried to enter, according to Capital Public Radio. But confrontations between the protesters and police or other civilians were minimal and the march was largely peaceful. Associated Press reporters Sophia Bollag and Don Thompson in Sacramento and John Antczak in Los Angeles contributed.